For nearly 140 years ADT has been the leader in home security. Brinks also enjoyed a prominent position for a while but never was able to crest ADT’s market power. ADT ended up purchasing the home security division of Brinks (briefly called Broadview). In the last 20-25 years, several new companies have entered the fray and enjoyed success as well such as Monitronics, Vivint, and Protection One. All these companies have done quite well as more and more people adopted total home security. Only your least profitable customers who have the least sophisticated needs are interested in the newer competitive products while your most profitable customers who have the most sophisticated needs still prefer your products. Because of this, you write off the new products as “niche” and don’t worry too much about them. Let’s think about this for a bit with reference to home security and put ourselves in the shoes of ADT. 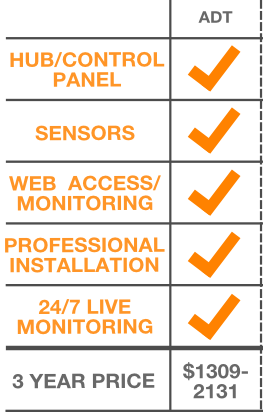 Even though I use ADT as an example, this analysis could apply to all the major home security providers mentioned above. 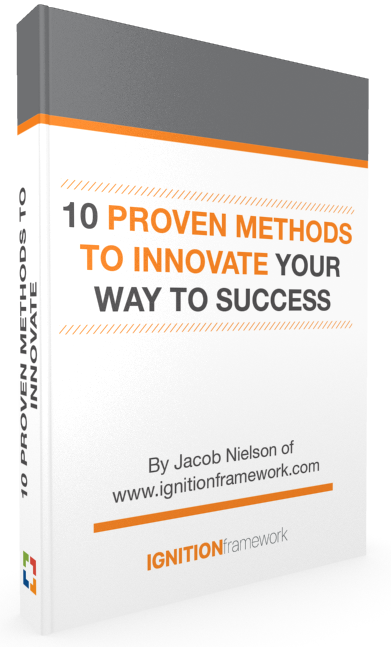 Point 1: Your company has enjoyed a reasonable, if not a substantial, amount of success. – Yup, sure has. Sensors cover everything from door, window, temperature, motion, glass breakage, flood, CO, fire, medical alerts, etc. I don’t know how their products and services could be much more advanced than this. 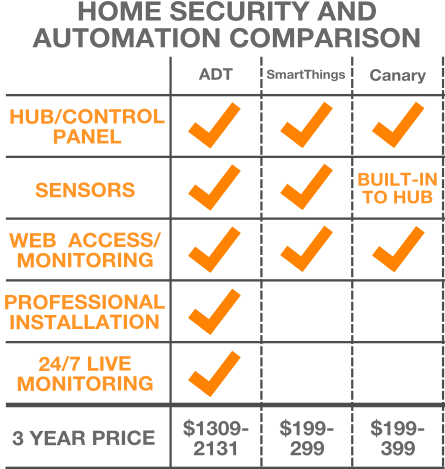 As for their customers paying top dollar for these products and services, the ADT website states that for $49/month and with a 3 year contract of between $35-47/month customers can get the basic home security package for a total cost over 3 years of between $1309-1741. 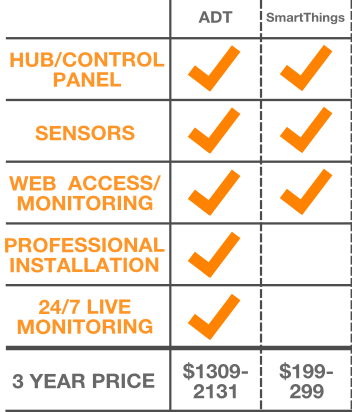 And for $79/month and with a 3 year contract of between $47-57/month customers can get the basic home automation package for a total cost over 3 years of between $1771-2131. For simplicity sake, let’s call it between $1309-2131. Is this top dollar? Maybe but we won’t know until we analyze the competition. Hmmm… this isn’t sounding good for ADT so far. Just to summarize, we now have the comparison shown in the image on the right. With Canary, there is no installation whatsoever. All you do is place the device in a central location in the home and it uses an array of sophisticated sensors and cameras to monitor conditions in the home. The product is available for pre-order for essentially $199/device (bundled prices are slightly lower). For simplicity, lets assume buying one device provides basic coverage and buying two devices provides advanced coverage. One thing to note about Canary is that it differs from the other two in that it requires no modifications to the home whatsoever. This means that anyone – including renters – can purchase home security. Given that 35% of U.S. households are renters, this is a substantial market segment that is essentially unserved by traditional home security companies. This is because ADT’s contract requires home ownership before they are willing to let the installer do the install. I suppose SmartThings assumes the impact on the home is minimal and since installation is DIY, they probably figure you’ll use your own judgement on whether or not your landlord will mind if the components are installed. See table below for detailed data from the last census report. Source: NMHC tabulations of 2012 Current Population Survey, Annual Social and Economic Supplement, U.S. Census Bureau (http://www.census.gov/cps). Updated October 2012. Point 3 isn’t looking so good for traditional home security and home automation companies. Let’s look at point 4. 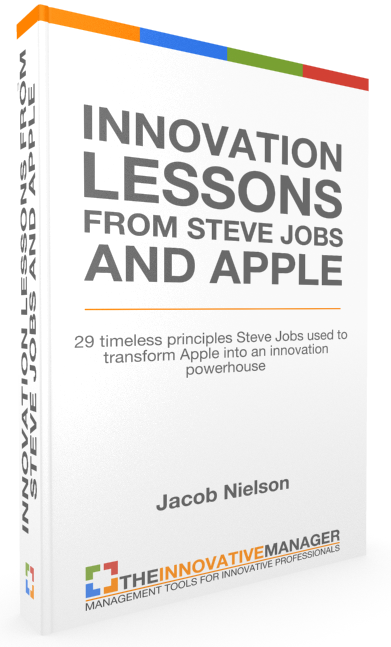 Point 4: Only your least profitable customers who have the least sophisticated needs are interested in the newer competitive products while your most profitable customers who have the most sophisticated needs still prefer your products. Because of this, you write off the new products as “niche” and don’t worry too much about them. The hallmark of disruptive innovation is that in the beginning, disruptive products are demanded only by customers with low-level performance and service needs. This is either because the customer is advanced enough to do much of the customization work by themselves (DIY, for example) or because the customer can’t afford the more expensive and more advanced option. When SmartThings debuted in 2012, only tech gurus seemed interested in the products. 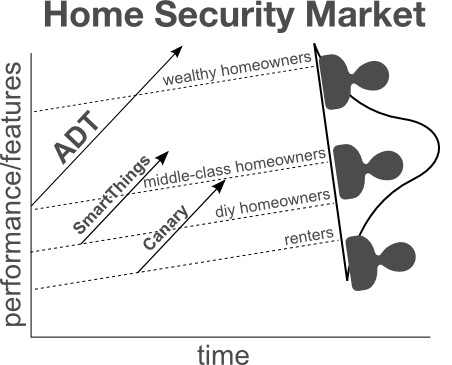 Most middle-class to wealthy homeowners – the bread and butter customers of ADT and other similar security providers – were not aware of, or interested in SmartThings. See this article in the PioneerPress for more on that. Regarding the niche issue, I wouldn’t be surprised at all if in some board meeting conversation at ADT (or other major security provider) the topic of SmartThings was brought up and a high-level executive said that those products were niche and couldn’t even come close to matching the performance of the ADT service. And that would be a true and accurate statement but the problem is that it ignores the time element. 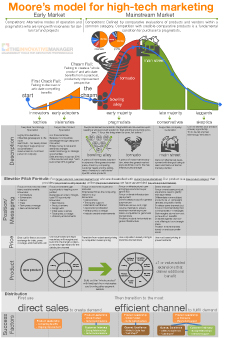 Disruptive innovations always start out as niche then as they gain support among the basic users, they start to penetrate mainstream customer segments over time. That’s where the rub is. Now that we’ve shown compelling evidence that ADT (and other similar companies, Monitronics, Vivint, etc.) may be caught in the innovator’s dilemma, the question is what should they do to get out and remain successful? This quote is essential for getting out of the innovators dilemma. Why? Because getting out of the innovators dilemma is about making the decision to cannibalize your own high-margin products with other low-margin products. It’s about “mixing down” in overall profitability. Wall Street and the board won’t like to hear that, but the alternative is even worse. If your products become cannibalized by a competitor then you run the risk of selling high-margin products to fewer and fewer people. That’s not a good thing. In many cases, the answer to this is to enter new markets and grow in new ways than before. When I say new markets, I don’t necessarily mean new places or geographies like India or China. Rather, I’m referring to creating products and services for adjacent spaces or industries that are similar to yours or where your business can provide some unique value. Vivint did this when they decided to enter into the solar power industry with Vivint Solar. They applied some of the same distribution, training and customer service skills they learned from home security to the solar business and started gaining market share. 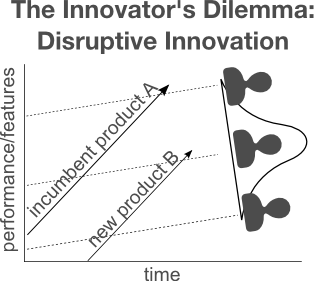 Another path would be to create and distribute your own disruptive innovations. When Steve Jobs announced the iPad he positioned it as a “post PC” device. I think he also anticipated sales of the iPad would cannibalize sales of Macs in general. As a case in point, just 18-24 months after the iPad went on sale, Mac sales began to slow and eventually decline. Essentially the affordability and simplicity of the iPad disrupted the performance and premium priced Mac. And that’s just fine with Apple because they would rather it be them doing the disruption than someone else. One Response to "Disruptive Innovations Are Flooding The Home Security And Automation Industry"
I recently hired the team at Pure Audio Video to install an automation system for my Miami office. Unlike other companies I’ve met, they are licensed and insured. I appreciated that the owners showed up with the installation team to ensure that the process went smoothly. Their expertise allowed them to provide exactly what I wanted. I recommend them to anyone wanting a home or office automation system. Visit them at http://www.pureaudiovideo.com or call (954)-581-4434.